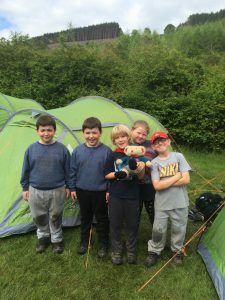 On the 17th-19th June 2016, 44 children had an adventure to celebrate the centenary of cubs. The three groups from the Merthyr District were, 2nd ‘The Quar’, 4th Treharris and 6th Troedyrhiw. 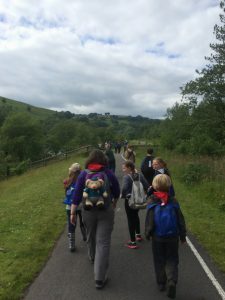 The camp took place in Cwm Parc Darran, Deri. It started on the Friday night we arrived there and we had to put up our tents, later we played on the field. After that we had our dinner a hotdog sandwich or jam sandwich. 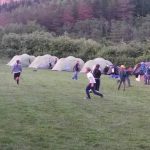 We were allowed to play some more until bedtime then it was into our tents, sleeping bags, sort out our pillows and sleep. Saturday morning we woke up got dressed had cereal and a cooked breakfast. We had a kit check to make sure bags were tidy in the tents. We had a quick playtime and then it was a day planned with activities. 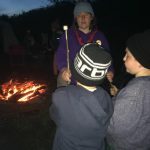 We were split into 3 groups and we all had a turn of doing each of the following activities, going up into the woods to play scouting laser tag and den building, a nature walk around the lake which included nature art and a go on the assault course, in the field we did some Athletic activities and then backwards cooking on the camp fire. Lunch time we had sandwiches, pack of crisps and a piece of fruit. After that we could play games on the field while waiting for food; I had chicken curry. 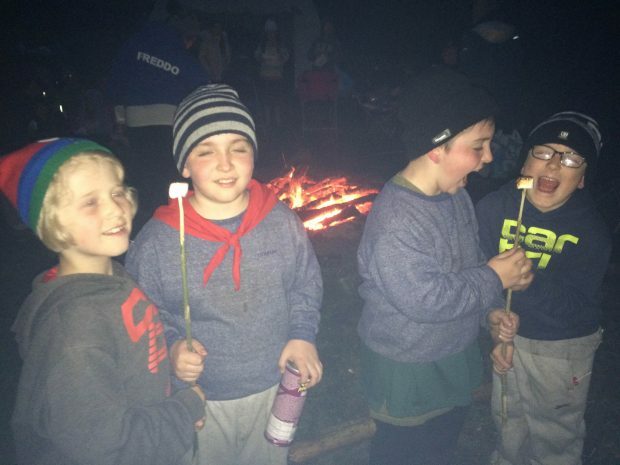 We had fun telling jokes doing comedy sketches around the camp fire, roasting marshmallows and singing camp songs before bedtime. Sunday Morning we woke up and had breakfast and next it was kit check time to make sure we had packed up our sleeping bags, clothes and had left the tents clean and tidy. We had visitors, A & S Animal Encounters; we had a chance of holding cockroaches, millipedes and a chameleon. We met some lizards and were allowed to touch them. They showed us the cute animal’s one by one, a baby raccoon, a bear cat and a meerkat. We did some activities and played some games. 2 o’clock was home time and then I stayed to help to put the tents away and then it was time for me to go home.